Mixed housing and athletic grounds mark the next stage of Regent Park's transformation. Progress on phase two of the Regent Park Revitalization project— Nelson Mandela Park Public School is to the right. Attendees at the official launch ceremony. Left to right: Deputy Mayor Norm Kelly; Councillor Pam McConnell; Bud Purves, chair of the TCHC board of directors; Greg Spearn, interim president and CEO of TCHC. Commemorative bricks to mark the occasion. “It’s a pleasure to have a brick presented to me rather than thrown," observed Deputy Mayor Norm Kelly. The unveiling of the designs for the Regent Park Athletic Grounds. This drawing by Nelson Mandela Park Public School students imagines what it will be like to play on the new soccer field. Concept drawing for the soccer field/cricket pitch. Image courtesy of TCHC. Rendering of view of Regent Park Athletic Grounds plaza from Sumach Street. Image courtesy of TCHC. Rendering of south tower of One Park Place. Image courtesy of TCHC. A map outlining the phases of the Regent Park Revitalization. Phase three is the blue area on the right. The wrecker sat ready, waiting for dignitaries and residents to finish their countdown. 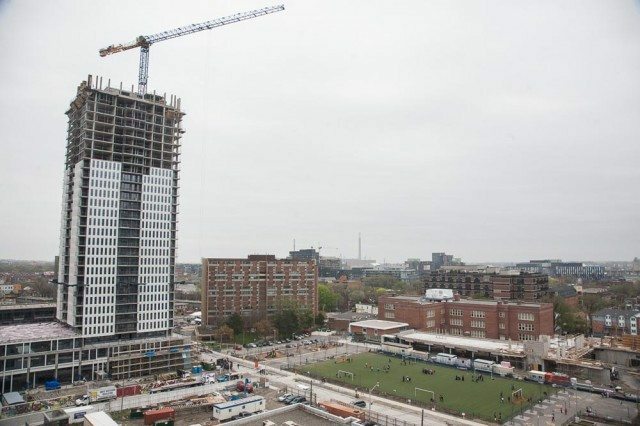 When they reached zero, the machine’s jaws smashed through the roof of an aging townhouse, and phase three of the Regent Park Revitalization was officially underway. This morning’s ceremonial wrecking kicked off a five-year process that will see the transformation of the southeast corner of Regent Park—bounded by Dundas, River, Shuter, and Sumach streets—into a mixed-income neighbourhood. Plans call for Toronto Community Housing Corporation and The Daniels Corporation to build 614 geared-to-income units, 50 affordable rental units, and six market-priced condo buildings, the most prominent of which will be the south tower of One Park Place. TCHC interim president and CEO Greg Spearn promised that residents displaced by construction would be treated with “fairness, respect, and empathy”—and vowed to speed up the construction of replacement homes, 900 of which are currently scheduled to be built over four years starting in January 2015. Students from nearby Nelson Mandela Park Public School unveiled designs for the Regent Park Athletic Grounds, a 2.8-acre complex that will feature a soccer field/cricket pitch, an NBA-size basketball court, a running track, and a refurbished hockey rink. This project is backed by the Maple Leaf Sports and Entertainment Foundation, whose executive director, Michael Bartlett, promised that pro athletes will be involved in events at the facility. One obvious sign of MLSE’s involvement: the prominent placement of Toronto FC’s logo on the soccer field. The professional designs were accompanied by student drawings depicting the activities they’ll be able to enjoy on the new grounds. “It feels like we are flying,” wrote one student, imagining what it will be like to skate there. Phase three is scheduled for completion in 2019.